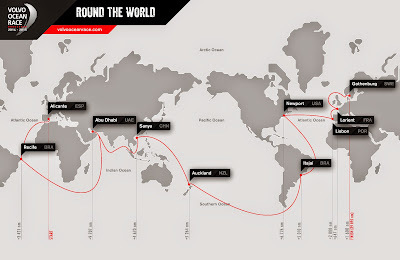 The route will take in 10 cities in nine countries – Spain, Brazil, United Arab Emirates, China, New Zealand, United States, Portugal, France and Sweden – and will require the teams to cover 39,895 nautical miles – equivalent to 45,910 miles or 73,886 kilometers. The Race will start on October 4, 2014, day of the first In-Port Race in Alicante, and finish with a final In-Port Race on June 27, 2015 in Gothenburg, the Swedish home of Volvo. The start of the race will see the brand new Volvo Ocean 65 racing boats sail from Alicante in Spain to Recife on the north east tip of Brazil over 3,421 nm. From there, the teams will sail the longest leg of the race, making their first dive into the Southern Ocean on their way to Abu Dhabi (9,707 nm) before heading to Sanya in China (4,670 nm).